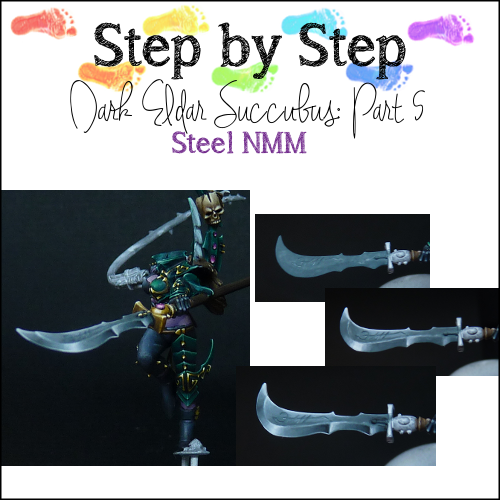 It’s been a little while, but finally it is time for the latest installment of the Dark Eldar Succubus step-by-steps. 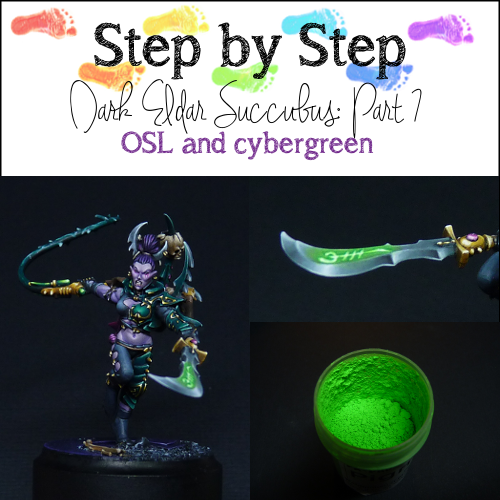 In this post I would like to share how I painted the OSL (Object Source Lighting) on the blade and other cybergreen parts (I don’t really know wat it is supposed to be, but I thought of it as some tubing with fluorescent goo in it). 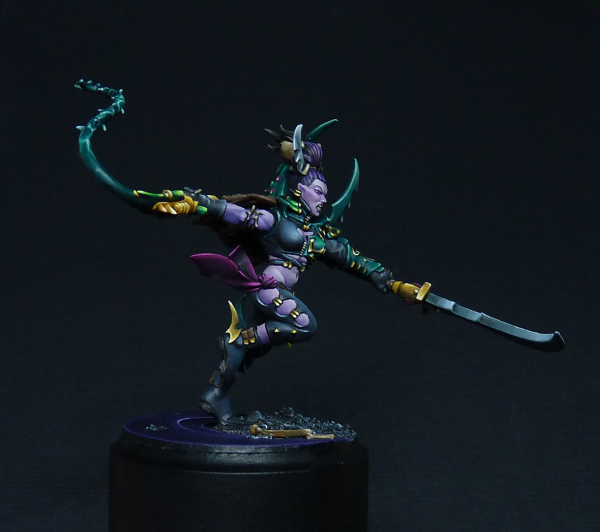 On a sidenote: The girl is now finished, so here are some pics! I would love it if you vote for her on Putty & Paint or CMON. In the following steps I have used a dayglow pigment, or daylight fluorescent pigment, by PK Pro to create a very bright effect. 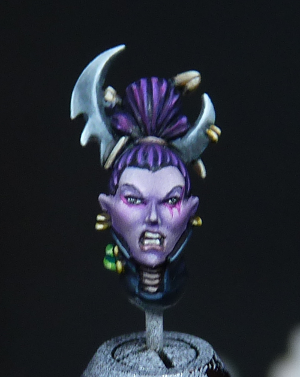 You can create the OSL effects without these pigments, but I wanted to try it out in this way and I quite liked how it turned out. I do have to mention that I had difficulties painting with only diluted pigment, as it became very rough and granular, despite a good dilution. 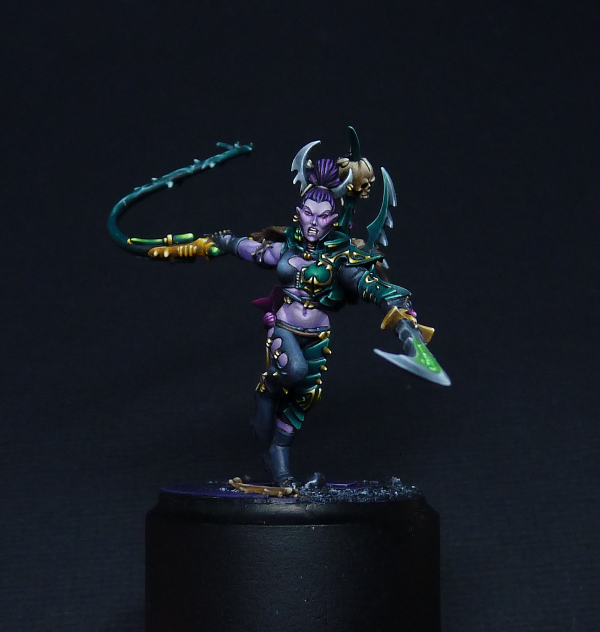 Probably it would be better to dilute the pigment with acrylic binder (as I have read on this great post on Massive Voodoo), but mixing it in with paints also works fine enough. 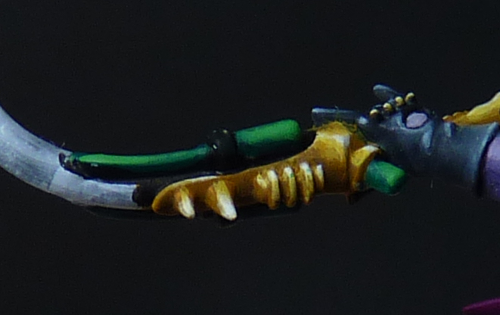 For OSL it is much easier to work backwards then my normal trategy (start middle colour, then shade, then highlight). Therefore I start by painting in the highlights, which is the area that is supposed to emit the most light. 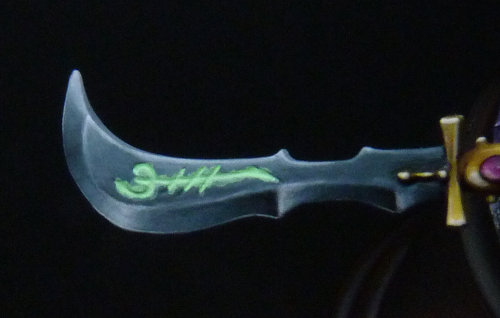 This blade has some nice details carved in, and I painted the whole recessed area with a mix of white and scorpion green (GW, old colour) in a ratio of 3:1. 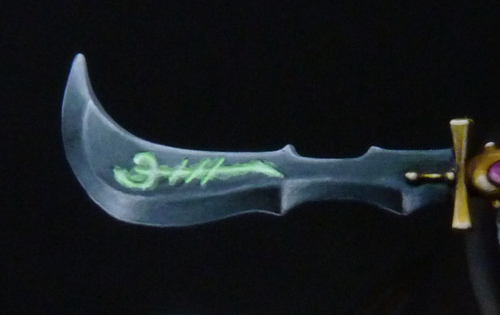 Don’t worry about painting over the sides of the carvings, because you can clean that up later. In the parts where two lines of the carves cross (on the crossroads let’s say), I painted pure white to make them even brighter. 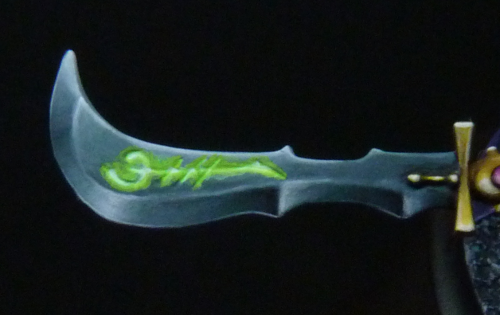 In this step I painted the edges of the carvings with dayglow pigment in the colours glowing wood by PK-pro, mixed with scorpion green. I think about 1:1, but it’s hard to guess. The colour is very undiluted as you can see on the picture. Then of course a lighted object will emit light and will cast a glow on surrounding areas. I wanted to keep that area relatively small to not obscure too much of the painted NMM on the blade. I used the same colour as in the previous step, diluted to a glaze consistency. The closer to the carvings the more layers I painted of this mix, to make it look as if the colour fades the further away it is from the light source. 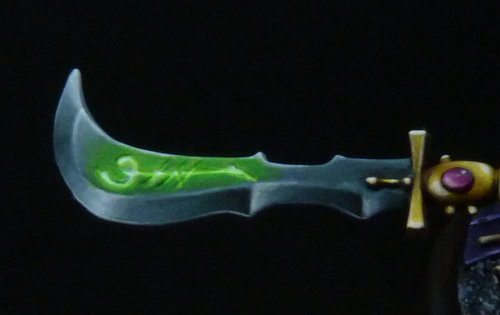 As the blade was looking a bit messy, I cleaned it up, using the same colours as before. During the clean-up I had lost some of the highlights inside the carvings, so I carefully painted them in again using white. 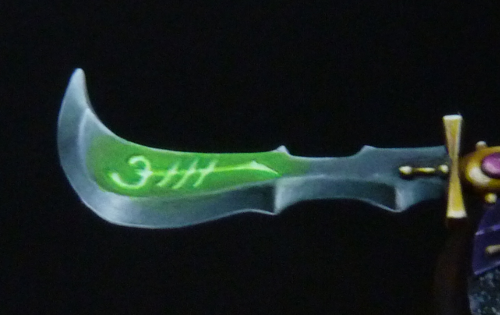 I also wanted to increase the contrast a little, so I added a bit of kabalite green to the glow mix (1:1) and painting that on the very edges of the carving. 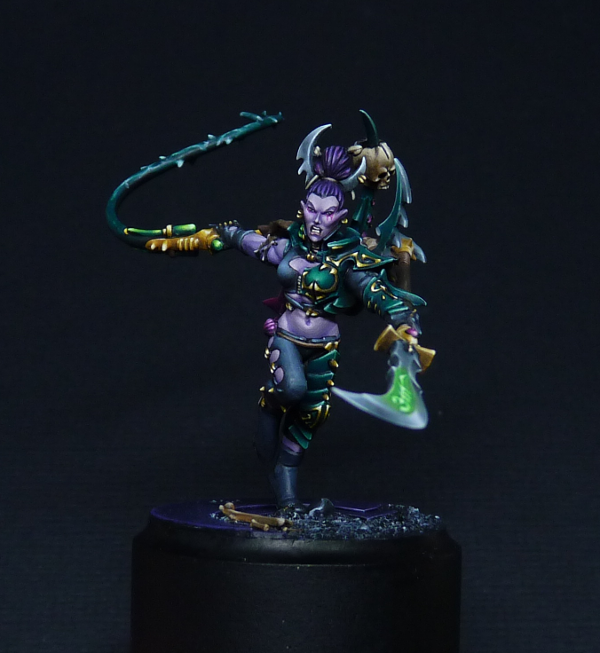 Sadly, because the dayglow pigments effect the pictures a little I did not manage to capture that clear enough. 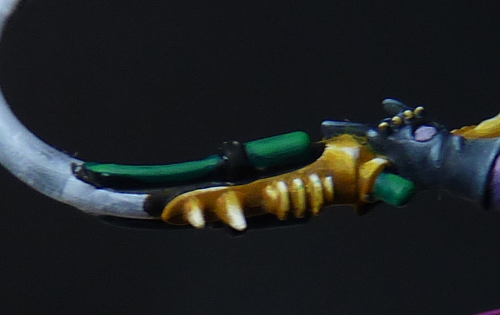 These parts were painted in another reverse way, namely by starting with the darkest colour. 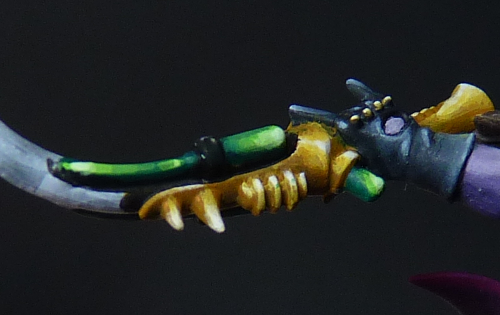 I started by painting the whole area with a mix of Incubi darkness and kabalite green. 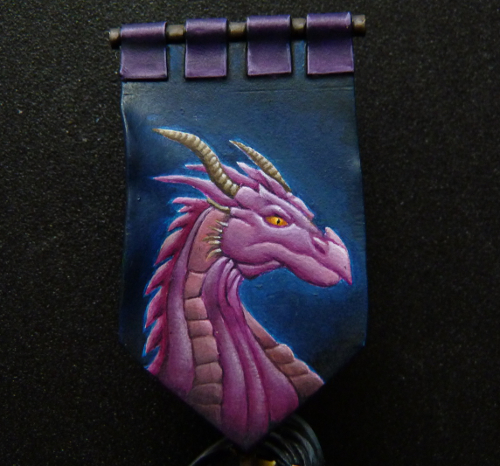 If you have followed all the step-by-steps you might remember that I used these same colours for the base of the armour. I did this to make sure there is some coherence between the colours. Still, by using different colours in the highlights the end result looks very different from one another :). 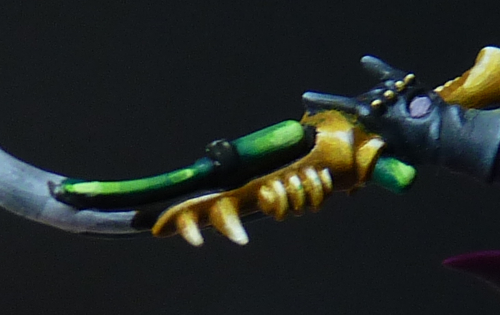 Using pure kabalite green I painted a bit smaller area. 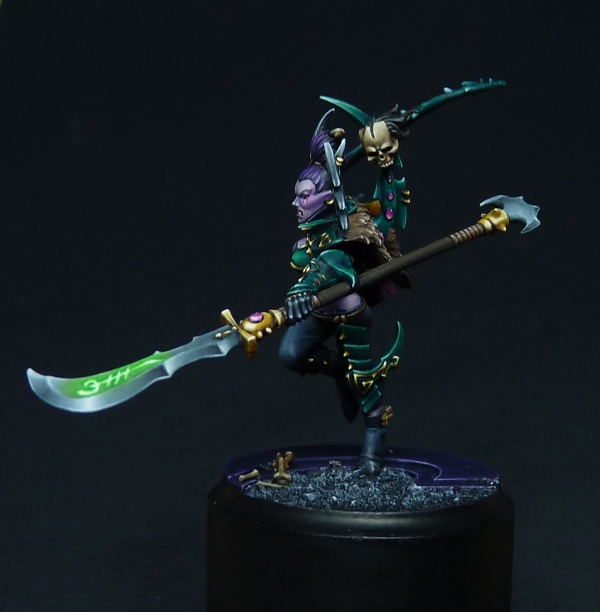 In all these steps my paints were diluted to somewhere between basecoat and layering consistency. It is a small area, and I wanted to paint it quickly. 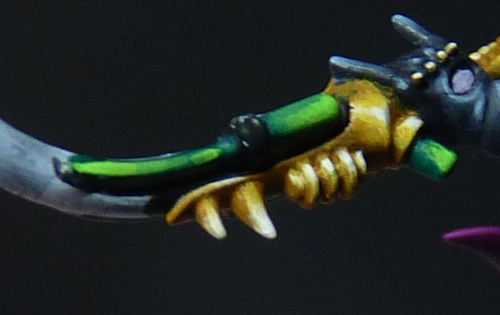 I mixed some of the dayglow pigment with the scorpion green, about 1:1 and painted that as the next highlight. To make it even more vibrant I added some more dayglow pigment (1 part) and some white (2 parts) to the previous mix (2 parts). 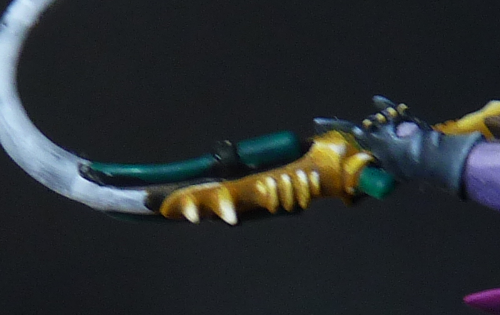 Of course, so area on this mini will go without spot highlights :P, so I painted in spot highlights using pure white. After that, I smoothed out some transitions but I forgot to take a detailed photo of that. I painted the tubing aroung the ladies neck in the same manner as described above. I hope you all enjoyed this post! And, more importantly I hope you like the end result of this project :). It was definitely interesting to take pictures of each step, really makes you think about your own painting techniques…. 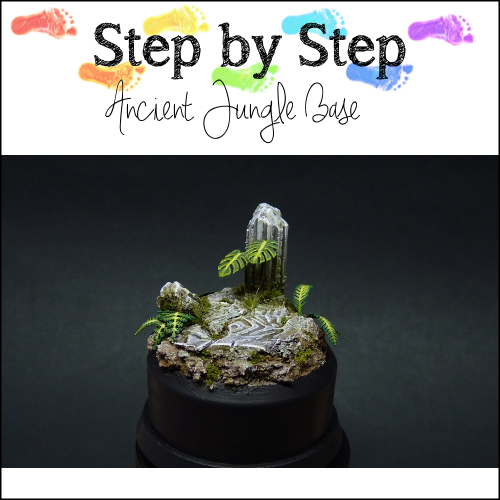 In the next step-by-step I will show you all how I made and painted the base. Amazing job. I want to make something similar with a Tron theme. those pigments look like they are the perfect solution. Is there a place to buy them? Hi Guillermo! Thanks for your comment 🙂 apologies for the late response. I have bought the dayglow pigments at http://www.pk-pro.de .